Bridge to Home formally thanked Fifth District Supervisor Kathryn Barger for providing the funding necessary to fill the gap to keep the shelter open year round and also the City of Santa Clarita for support and donation of land. Bridge to Home is in the process of transitioning from an emergency winter shelter to a year-round 24-7 operation, which will take services from the current temporary trailer units, to a campus with several permanent buildings and running water. Supervisor Kathryn Barger has been supportive of Bridge to Home, giving funds for the much-needed water and sewer line and more recently providing the funds to keep the shelter doors open until the next Los Angeles Homeless Services Agency grant is available. April 1st through July 1st the shelter will be open from 6pm – 8am for 45 people with a plan to transition from homelessness to housing (Bridge Housing). 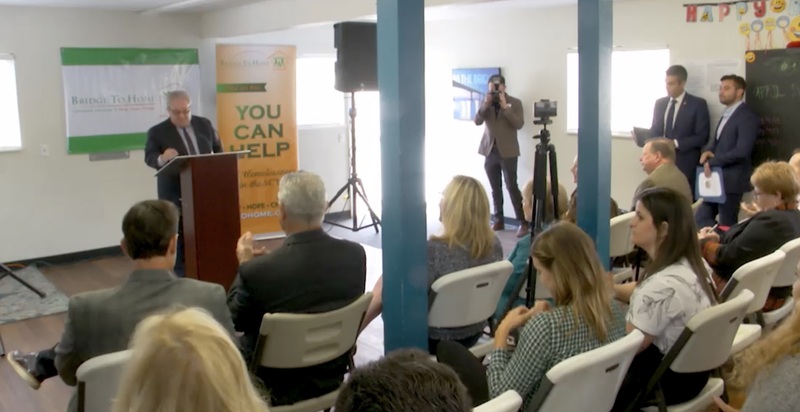 The City of Santa Clarita has provided financial support to Bridge to Home, as well as deeded more than a million dollars of land for the new, permanent shelter. Bridge to Home staff and board members will formally thank the Supervisor and the City for their support which gives our community members experiencing homelessness help and hope … so they can make a change.